When Congress discusses the search for intelligent life in the universe and the seemingly related topic of UFOs it usually falls under the purview of the House science committee. Exceptions were when the Pentagon was still examining the phenomena in an attempt to establish if UFOs posed a threat to national security. 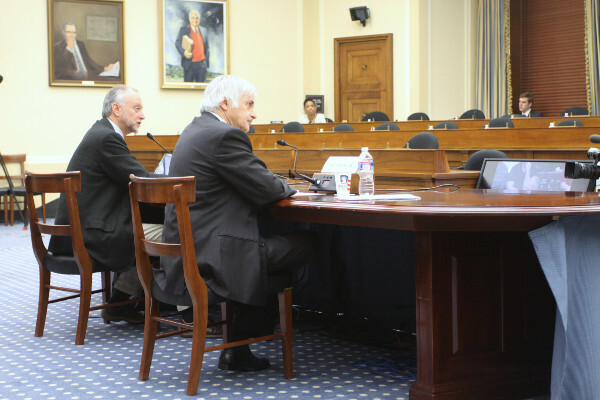 Then it was the House Armed Services Committee that held a hearing. 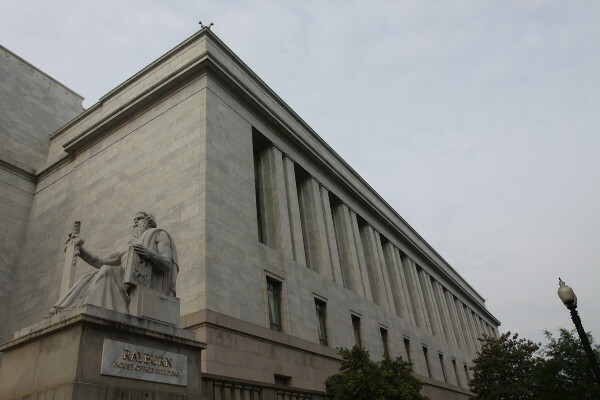 The last time a hearing was held specifically about the singular topic of UFOs was in 1968, the hearing was called “The Symposium on Unidentified Flying Objects” and several prominent scientists were called to give witness testimony. Those scientists included J. Allen Hynek, James McDonald and Dr. Carl Sagan. 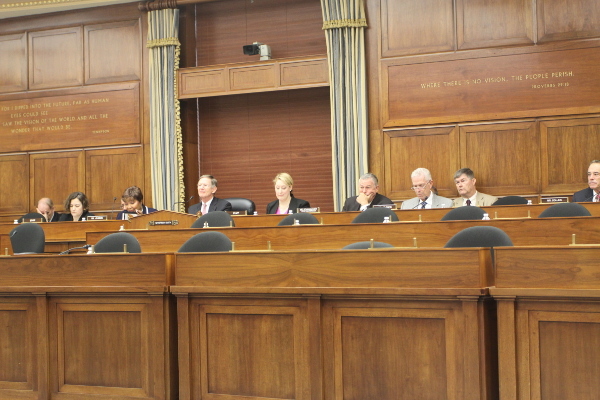 That symposium was held in the same room in which the current House science committee meets, Room 2318 of the Rayburn House Office Building. Opening remarks by Chairman Lamar Smith (R-TX) mentioned a high school class from Herndon, Va present in the hearing room that had specifically chosen this hearing topic for a class field trip from a list of several different choices. With the current popularity of the federal government’s efforts to shine a light on science, technology, engineering, and mathematics (STEM) awareness, it was no surprise that Smith singled out the class field trip and praised the young students. After Shostak and Wirthimer gave their prepared opening statements the floor was open to questioning by the committee members. 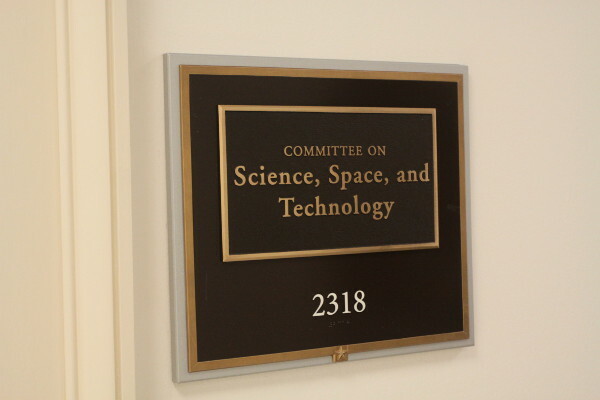 Representative Bonamici (D-OR) asked the witnesses if there was a contingency plan for the day when intelligent life is found to exist on other planets. To which Shostak replied that there is no plan other than a few SETI protocols. Shostak continued that there is no secret government project designed to cover up extraterrestrial contact should it occur and that the government simply doesn’t care about such things. Such speculation isn’t surprising however considering the popularity of movies like Contact which was mentioned earlier by Shostak in his opening testimony. The film production for Contact used Seth Shostak as a consultant and also received US government cooperation from NASA and the Department of Defense. In the film, an extraterrestrial signal is detected and the astronomers have to thwart attempts by the Pentagon to appropriate and militarize the project. There was a noticeable shift in the discussion from seemingly thoughtful questions to the more esoteric when Congressman Chris Collins (R-NY) prefaced his inquiry with “I think I might ask the question everyone in this room wants to ask…” At this point there was a brief pause and an almost palpable sigh of “here we go…” floated around the witness table. 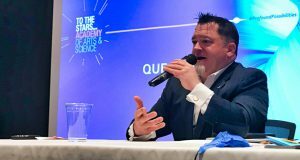 Collins then launched into a question unrelated to SETI involving the television show Ancient Aliens and if the two scientist witnesses had ever seen it and what they thought about the program. Hardly a relevant question in regards to radio astronomy but the SETI scientists held their own and Dr. Shostak responded that he had in fact been interviewed and appeared on Ancient Aliens and then stated, “I think that the pyramids for example were probably built by Egyptians, I know that that’s a radical idea for some people…” Responding to the same question, Mr. Werthimer said, “UFOs have nothing to do with extraterrestrials, even though I’m optimistic with life, there is no evidence that any of these sightings, some of these sightings are real phenomena. We get a lot of calls when the space station goes over, although some people embellish and they say it has windows and things. And some of it is people’s imagination and we know that because it ties very closely to popular culture.” He goes on further to say, “When people watch movies then we get a lot of reports that are tied to what’s in the movies and some of it is actual deliberate hoaxes for people making money.” Both the congressman and the witness’s remarks received laughter from the audience in the chamber. Then Congressman Collins, satisfied with his statements, sat back and read something in his lap for the rest of the hearing. After the “ancient alien” question, Representative Edwards (D-MD) prefaced her query with, “You know, my favorite movie is Contact, right, so every year it comes out since 1997… I watch it, I dream, I think, well, you know, who knows?” and then went on to ask about the panchromatic SETI project and a question about internet security concerning the open source SETI crowd sourcing research program called SETI@home. Then Representative Posey (R-FL) asked a question concerning the SETI scientist’s thoughts on Project Blue Book, a USAF 20 year program that investigated reports of UFOs and which closed in 1969 almost 45 years ago. 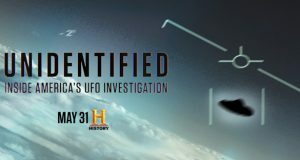 Shostak responded that he is skeptical about the UFO phenomenon and that “one third of Americans believe that we are being visited: that’s the result of polls that have been taken since 1960s and that number doesn’t change.” The Project Blue Book question was rather stale and again not relevant to the SETI format. The only time the SETI representatives differed on opinion was on a question concerning active SETI and passive SETI or should we as a planet be actively sending signals into space in an attempt to seek out intelligent life elsewhere. Werthimer thought this was a bad idea while Shostak admitted that we have already been sending signal into space though not intentionally except for an instance when NASA broadcast the Beatles song ‘Across the Universe’ toward the star Polaris. Representative Schweikert (R-AZ) did his own roundup when asking questions of the SETI scientists, noting the references to a previous remark made by Shostak about the Beatles song being intentionally beamed out into space, another remark about whether or not aliens will enjoy Earth’s television programming which is also being beamed out into space and his colleague’s remark about the movie Contact. 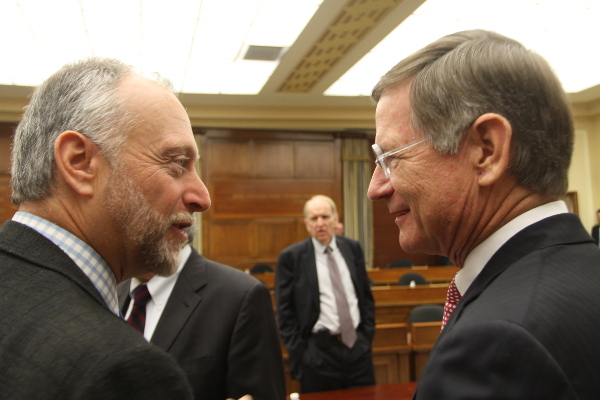 After Shostak offered a scenario about ordinary people sitting around in a bar sharing drinks and speculating about life on other planets, Schweikert proposed, “seeing some of our questions, there may have been a lot of drinks going on,” a rare moment of Congressional self-awareness. There is no doubt that popular culture concerning aliens and UFOs has had an influence on the general public’s question of “Is there other life in the universe?” Popular culture also appears to have had an effect on the opinions of members of Congress, a terrifying notion when you realize that pop culture is affecting public policy and the legislative balance of our society. With an overall approval rating of 13%, Congress should probably focus less on pop culture ideas of “little green men” and juvenile giggles which are more appropriate in an elementary school cafeteria and focus more on actual scientific endeavors meant for furthering our understanding of the universe. 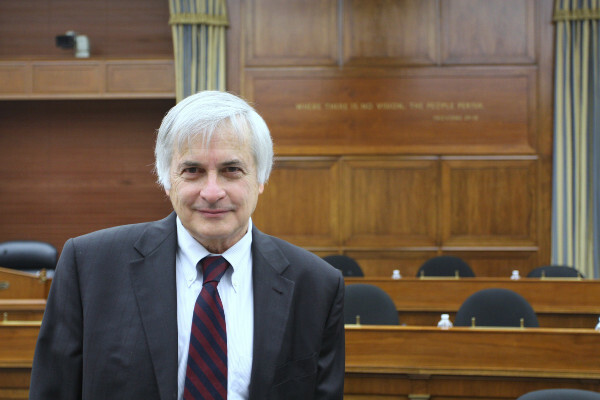 But Seth Shostak is hopeful and doesn’t think that UFO pop culture diminishes from the scientific search for extraterrestrials. Maybe it’s not such a bad thing, if pop culture raises awareness behind the actual science involved in trying to prove that we are not alone in the universe. Perhaps pop culture is the only way the public can truly relate to the incalculable scientific reality behind the potential for life in the universe. Photographer, researcher, and writer living in central Virginia. Articles and photos have appeared in Open Minds, Fate, Huffington Post, History Channel, and CBS News. Shostak doesn’t speak for MUFON. 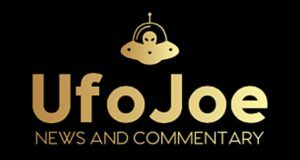 The Citizen’s Hearing for Disclosure, the real evidence of 50 years, was ignored for SETI, which has no evidence of significance that explains the thousands of UFO and alien contacts, and abductions worldwide. To reduce all of this evidence to mere popular culture, and myth, misses the point of evidence collected and publically stated by many credible NASA, military, and law enforcement witnesses. The truth is not in Washington, it’s everywhere but there. The definition of who, or what Department will provide Official Disclosure needs to change. The evidence is they are already here, been here, and hidden elements work with aliens on joint projects.